We have 33 intimate & comfortable rooms situated around our 20 acre grounds in eight buildings. All rooms have ensuite bathrooms & have complimentary tea & coffee making facilities. None of our rooms have TV’s or Telephones so as not to distract you from the glory that is Wells Gray Provincial Park & the wilderness that surrounds & welcomes you. None of the rooms at the lodge have kitchens or fridges in them. We do have a fridge that all guests are welcome to use at the Front Desk area of the main Lodge, which is accessible throughout the day from when front desk opens & closes. The Standard rooms are situated over six buildings. Two rooms are situated in the original McDougal Cabin built by the Hogue brothers in 1922. These two rooms have one double bed in each room. These can Sleep up to a maximum of two people. One chalet block houses eleven rooms. Nine of these rooms sleep up to four people & have two double beds, the other two rooms sleep up to three people & have one double bed & one single bed. The Six rooms upstairs have a balcony & the five rooms downstairs have a small deck area in the front of the rooms. The remaining standard rooms are in four more chalet buildings & each of these buildings house three rooms in each. These come with two double beds in each room. All of these rooms have a small deck area in front of the rooms. All standard rooms have a view over the Golf Course & the Trophy Mountains. Low Season (May 1st – May 31st & September 16th - September 30th) $159.00 plus taxes per night - Double Occupancy. High Season (All of June, July, August & September 1st – September 15th): $219.00 plus taxes per night - Double Occupancy. 2017 Completed renovations to the Log rooms - These rooms now come with two queen sized beds & all have new carpet laid in the rooms. The Log Rooms are situated in two buildings. These are situated in two Log cabin buildings that were added to the Lodge’s property in 1987. Each building houses four rooms. Two upstairs with balconies & two downstairs with deck areas in front of the rooms. These rooms sleep up to four people, with two queen sized beds in the rooms. The downstairs rooms can accommodate five people with a single rollaway bed. These rooms not only overlook the string of horses here at the Lodge & the Golf Course but have a great Trophy Mountain view. Low season (May 1st – May 31st & September 16th - September 30th): $175.00 plus taxes per night - Double occupancy. High Season (All of June, July, August & September 1st – September 15th): $239.00 plus taxes per night - Double Occupancy. All room rates are based on double occupancy. Supplements apply for 3rd & 4th person’s sharing the room. Children 11 years & under are free of charge when sharing a room with Adults. 3rd & 4th Person supplements (all rooms): $24.00 plus taxes per person per night. 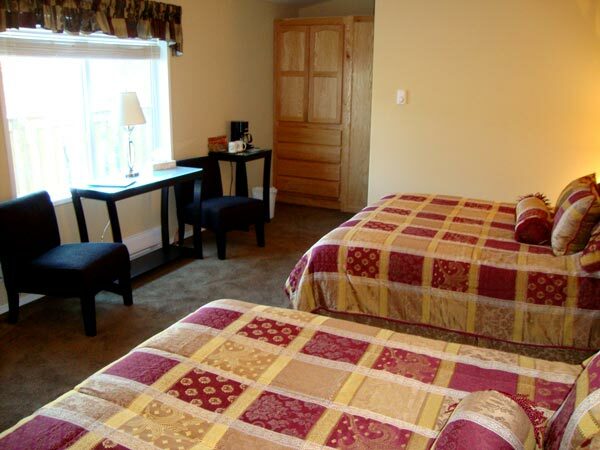 Single Rollaway beds are charged at $26.00 plus tax per night - These can only be added to the Lower Log Rooms. Rollaway's can not be added to any Standard rooms. Please note that rooms are allocated based on the amount of people & ages of the children in the room, so you may not get two double beds – all requests will try to be accommodated. All rooms are cleaned daily & your tea & coffee replenished by our helpful & friendly housekeepers. We do ask that our guests recycle there plastics & bottles & recycling area's can be found around the site. None of our rooms have any kind of cooking facilities or fridges in them or TV's. If you have food or medication that needs to be refrigerated, we do have a Fridge at Reception for guests to use whilst here at the Lodge. All Rooms are Non-Smoking - Smoking is only permitted in Designated smoking area's. Rooms have a 30 Day cancellation policy in place. Less than 30 days will incur a 100% charge of the stay booked. Payment for rooms is payable 30 days prior to guest arrival. All payments are charged 30 days prior to arrival to the credit card held on the Booking.